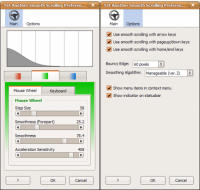 With this extension, you can customize smooth scrolling behavior. The extension is worth to use, if you are frustrated at any of below. - Step size for scrolling by the cursor keys is so short. - A built-in smooth scrolling is somewhat less sensitive and laggy. - When you flick a wheel so quick, scrolling should move farther but just count ticks of a wheel. DOWNLOAD YET ANOTHER SMOOTH SCROLLING NOW!